In 1546 Charles V commissioned the Conquest of Tunis series in honour of his recapture of Tunis from the Turks in July 1535. The Attack on La Goleta. 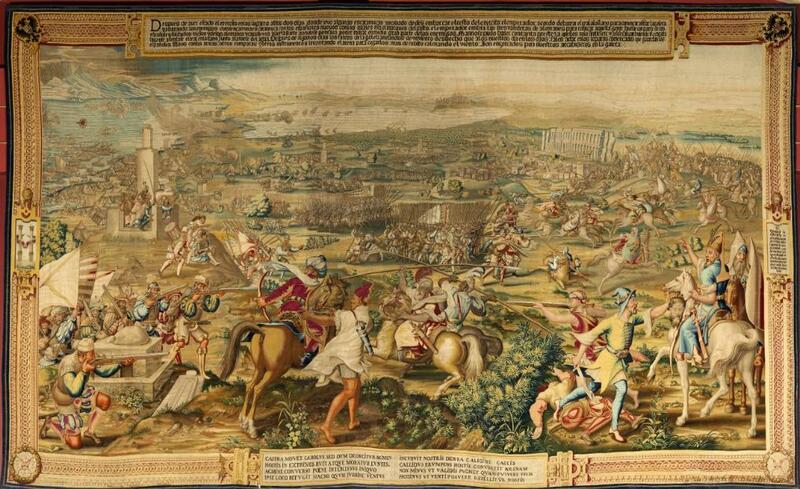 The attack on Goleta lead by the Marquis del Vasto, Charles V’s chief commander and general is presented in this panel in an epic, panorama view. Despues de aver estado el exercito en los lugares altos dos dias: donde ovo algunas escaramuças, y acabado de desembarcar el resto del exercito: el emperador acordo de baxar el real alollano para començar a sitiar la goleta y abaxando: los enemigos comieçan una escaramuça con los españoles nuevos, con los quales esta el marques del Gasto. El emperador embiadas tres vanderas de alemanes para reforçar aquella gente: buelve con parte de los españoles, soldados viejos, y de los alemanes y cavalleros, a cierta parte donde se pensava poder tomar en medio gran parte de los enemigos. Mas no se pude hazer con tanta presteza quellos no lo sintieren y asi se salvan huiendo. Regocida la gente, asientase el real en lo llano, junto a la torre del agua. Despues de algunos dias, los turcos de la goleta aiudandose de un viento deshecho que a los nuestros da en los ojos: salen a dar en los reparos començados que guardan los españoles. Unos con sus armas: otros con instrumentos, levantando el arena para cegarlos: mas de subito calmando el viento: Son encerrados por nuestros arcabuzeros en la Goleta. Click on parts of the image for a larger detail. CASTRA MOVET CAROLVS, SED DVM DEDVCITVR AGMEN HOSTIS IN EXTREMOS RVIT ATQVE MORATVR EVNTES. AGMINE CONVERSO POENE INTECLVSUS INIQVO IPSE LOCO REFVUGIT. MAGNO QVVM TVRBINE VENTVS INCVBVIT NOSTRIS DENSA CALIGINE CAECIS CALLIDVS ERVMPENS HOSTIS CONVERTIT ARENAM NON MINVS VT VALIDIS PVGNET QVAM PVLVERE TELIS PROTINVS VT VENTI POSVERE REPELLITVR HOSTIS. Origin: The Conquest of Tunis set was comissioned by Charles V. This panel is from the replica cycle comissioned by Philip V and finished by 1744. The expansive landscape in the background is dominated by the military encounters and skirmishes of the emperor’s Spanish forces with the Turkish forces at La Goleta. To the far left, is the bay of Carthage where the naval armada of Charles V has landed. In the far distance, lies the city of Tunis. The foreground is filled with life-size figures enacting dramatic scenes: Turkish and Moorish horsemen are in combat with a German arquebusier unit (to far left) sent by the emperor as reinforcements. To the right, a dramatic moment: a Turk has beheaded a Christian soldier and hands the head to his general. To the left, in the middle distance, is the Torre de Agua (the water tower mentioned in the long Spanish and Latin inscriptions) which imperial troops have finally gained control over and from where they have regrouped to attack enemy forces. The bird’s eye view in this panel is achieved with the sweeping perspectives deployed by Jan Vermeyen and Pieter Coecke van Aelst. One of the principal objectives that both artists aspired to in the entire series was to ensure that the viewer could always orientate and situate himself geographically in each panel by means of the perspective(s) used and the detailed written inscriptions. The Conquest of Tunis tapestries comprising of twelve monumental panels were the single most important tapestry set ever commissioned by the Habsburg court. These enormous tapestries commemorate - like a woven panorama - the fame of the Habsburg dynasty, celebrating Emperor Charles V as defender of the Catholic faith, and glorifying his victories over Turkish and Moorish forces at La Goleta and Tunis in 1535. The cycle was used so much during successive reigns of Spanish monarchs, that in 1731 Philip V, the Bourbon king of Spain, ordered from the royal tapestry works, the Real Fábrica de Tapices de Santa Bárbara, in Madrid a less expensive set made of silk and wool to preserve Charles V’s original series, or editio princeps which by this date became known as the “old Tunis set”. By 1744 these replicas of twelve tapestries was completed.